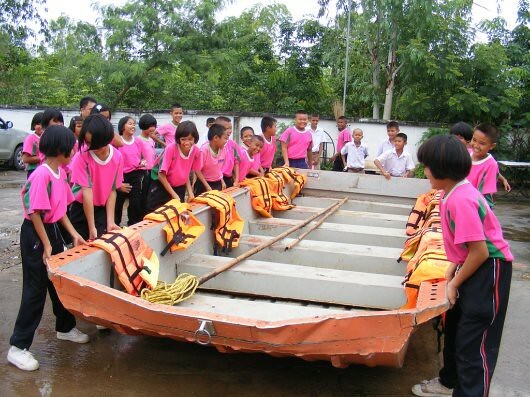 Children participating in flood management drills in Thailand. Photo by Asian Disaster Preparedness Center. The most prepared I have been for disaster was during my elementary school days in Yokohama, Japan. As earthquake is a common threat to Japanese life, we had periodic drills for earthquake and fire alarms, carried around disaster hoods, and stored food and water for emergency, both in school and in my community. By interviewing various stakeholders involved in disaster management and climate change adaptation this summer, it struck me that disaster and weather events are extremely personal and embedded in everyday life. The public sector does of course play a significant role in providing sufficient infrastructure to prevent and mitigate disasters, as well as be prepared to manage and respond to situations when disasters happen. However, individual and collective action on the ground is vital in carrying out these policies and strategies. The challenge for both disaster management and climate change adaptation is then, how do you motivate people to take action for the future while trying to manage several other pressing concerns? One way of doing it is through the utilization of memory and experience. In Japan, September 1st is designated as the Disaster Prevention Day, in memory of the Great Kanto Earthquake of 1923, where schools and communities organize earthquake and fire drills. In terms of memory and experience, communities in Vietnam and Laos seemed to have very recent experiences of flood and drought impacts. Finding ways to remember and reflect on these experiences may be effective in creating a need to prepare for future events. Another approach may be to link existing issues with the more long-term disaster/climate concerns. During my visit to Khammouane in Thailand and Nonbok in Laos, the main concern this summer in these flood-prone areas was drought, not flood. However, the focus of the disaster and climate change adaptation programs has been on building local capacities for flood. Of course, it may be impossible for disaster management programs to be able to address every single climate and weather-related issue experienced by the communities. However, creating a framework where pressing local concerns can be addressed within the efforts of disaster management and climate change adaptation, I feel, is important. Since returning from Bangkok to Cambridge, in midst of juggling my immediate concerns of papers and project deadlines, as a first step towards enhancing my own disaster preparedness, I have started to compile my own emergency kit. According to the Boston’s Mayor’s Office of Emergency Preparedness (MOEP), common weather-related risks in Massachusetts include, extreme heat, floods, hurricanes, thunderstorms, and winter storms and extreme cold, and there are various resources in the Boston area on how to prepare for disasters. The personal experiences and learning that I had this summer has definitely impacted my own thinking and actions on preparing for disaster and climate change on the ground, and I hope to continue on through both my personal and academic endeavors. Shoko, thank you for such a thoughtful series! Your last reflection really hits home, I love the way that you framed this discussion. I actually think about emergency preparedness nearly every day on my way to work. Because I study environmental management and work in CoLab where several colleagues/students are working in New Orleans and Haiti, I fully appreciate that there is no magic bubble over Cambridge and Boston protecting us from the natural elements. Also, Cambridge is the most densely populated area I’ve ever lived in, and it’s so close to Atlantic, I do feel concerned if a powerful Nor’easter were to come through how everyone would be able to safely evacuate the city. Your reflection points out that being prepared for an emergency is not being paranoid, it’s being smart. It’s connecting what we know about climate change with what we can do about it. Your exchange with the district disaster management official is profoundly telling. Americans are arguably the most responsible for climate change because our lifestyle is so carbon intensive and yet we show relatively little concern for abating climate change, and additionally to our own detriment, we have done very little at the public level to prepare for extreme weather conditions caused by climate change. Unfortunately as the people of Thailand and Laos understand, ignoring what we know about the havoc that climate change can wreak is not going to make it go away. But preparing for it could be a bring a daunting, long-term environmental problem into our lives in a tangible way. Taking these steps to prepare for a disaster, might cause us to take other steps related to our lifestyles to help abate climate change. Thank you again for sharing your experiences, I hope that others will read your wise words and do something about it as well.